Nestled between the foothills of the Blue Ridge Mountains and the Potomac River, Leesburg enjoys the best of both worlds – the peaceful tranquility of the country and the bright lights of the city. Located approximately 35 miles from the nation’s capital and just 15 minutes from Washington Dulles International Airport, it’s also the gateway to DC’s Wine Country and a short drive from the Blue Ridge Mountains. Leesburg is the county seat of Loudoun County, one of the fastest growing counties in the country, but it has held on to the authentic sense of place – grounded in its 250 years of history. Leesburg, like the rest of Loudoun County, has undergone considerable growth and development over the last 30 years, transforming from a small, rural, piedmont town to a suburban bedroom community for commuters to the national capital. Current growth in the town and its immediate area to the east (Lansdowne/Ashburn) concentrates along the Dulles Greenway and State Route 7, which roughly parallels the Potomac River between Winchester to the west and Alexandria to the east. The Town’s citizens are active and involved in making Leesburg the best place that it can be. Enjoy Community events like the annual Flower & Garden Festival, the 4th of July parade & fireworks, Holidays in Leesburg, the Acoustic on the Green summer concert series, and the year-round Leesburg Farmers Market. Attend a local history seminar at the Thomas Balch Library, take a fitness class, participate in sports and recreation programs, or cultivate a community garden plot at Ida Lee Park. Serve on a Town Board or Commission, organize clean-up activities during the annual Keep Leesburg Beautiful campaign, or volunteer with a local non-profit organization. Leesburg is a happening place, and the arts and entertainment offerings in Town are increasing all the time. Leesburg’s First Friday is a monthly celebration of the arts and the art of shopping. On the first Friday of each month (except January), the Leesburg’s Historic Downtown comes alive in the evening. Events include wine tastings, musical performances, comedy shows and special art exhibits in over 35 downtown locations. The Tally Ho Theater, a former movie theater built in 1932 in downtown Leesburg, hosts a variety of live national music artists and other events. Ball’s Bluff Battlefield & National Cemetery – located within the Ball’s Bluff Battlefield Regional Park, trails and interpretive signs commemorate the Battle of Ball’s Bluff, the first Civil War engagement to take place in Loudoun County. From April to November, the park offers free guided tours of the battlefield every Saturday and Sunday. Historic Downtown Leesburg – strolling the brick sidewalks of Leesburg’s downtown, you’ll find an amazing collection of well-preserved historic buildings, housing charming unique shops and restaurants. Exploring Leesburg, a walking tour guide to history and architecture, is available for purchase at the Thomas Balch Library and the Leesburg Town Hall. Loudoun Museum – located in an historic building in downtown Leesburg, the Loudoun Museum offers a variety of changing exhibits and children’s programs. The Marshall House – the restored home of General George C. Marshall and headquarters for the George C. Marshall International Center. Morven Park – this 1,000 acre property features the historic home of Virginia Governor Westmoreland Davis, the Winmill Carriage Museum, the Museum of Hounds & Hunting, beautiful grounds and gardens and an equestrian center that hosts horse shows & events throughout the year. Oatlands Historic House and Gardens – a National Trust Historic Site, this stately mansion was the home of the Carter and Eustis families. 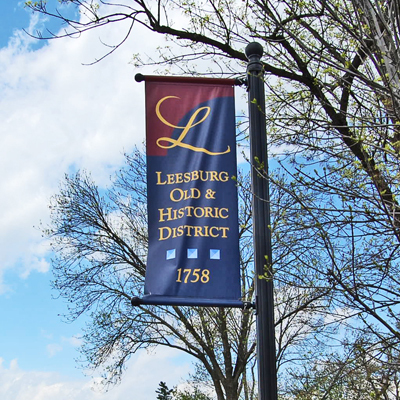 Leesburg is part of the Journey through Hallowed Ground National Heritage Area, a 180-mile long region that stretches from Gettysburg, Pennsylvania, to Thomas Jefferson’s Monticello in Charlottesville, Virginia, along the Route 15 corridor. Leesburg sits near the center of the corridor, making the Town a perfect hub for visitors to experience all that the Journey offers. Loudoun County’s population is the fastest growing of all counties in the United States. Since 2008, more than 2 million square feet of new commercial space, including office, retail and institutional, has been completed in the Town of Leesburg. Currently, over 1.5 million square feet of office, retail, commercial and institutional space and almost 1,500 new housing units are under development in the Town – either under construction, proposed as a by-right development project, or included in a zoning application. Leesburg operates the Leesburg Executive Airport at Godfrey Field, which serves Loudoun County with private and corporate aircraft operations. A designated reliever airport for Dulles International, the airport accounts for nearly $45 million per year in economic impact to the region. Also located near Leesburg is the National Conference Center, which the Xerox Corporation built in the 1970s. Government entities and private business use the Conference Center for meetings and conferences. Three main focal points connect this maze of underground buildings, one of which is currently the headquarters of Civilian Police International, a government sub-contract company. Leesburg is served by the Loudoun County Public Schools, which are consistently ranked among the finest in the nation. All of Loudoun County’s eligible high schools are included the best 1,000 high schools in America as rated by Newsweek’s Challenge Index. Leesburg currently has three public high schools operated by the Loudoun County Public School system; Loudoun County High School, which serves the western portion, Heritage High School, which serves the eastern portion, and Tuscarora High School, which serves the northern portion. A fourth high school, Riverside High School, will open for the 2015-2016 school year. Leesburg is also home to eight elementary schools and three middle schools. Leesburg can be reached by U.S. Route 15, State Route 7, or the Dulles Greenway Toll Road. Visitors from Maryland enjoy traveling to Leesburg via White’s Ferry, the last operating ferry on the Potomac River. The ferry has been carrying vehicles and passengers on a five-minute ride across the river north of Leesburg since 1828. Maryland’s MARC Train offers service to and from Washington, D.C., from Point of Rocks, Maryland, about 12 miles north of Leesburg. With its location at the western terminus of the Dulles Greenway toll road, Leesburg enjoys excellent access to Washington Dulles International Airport. In addition, the Leesburg Executive Airport, one of the region’s busiest general aviation airports, provides further transportation options into and out of the area. The Town is also accessible via the W&OD Trail, a hiking/biking trail that runs from Arlington to Purcellville, Virginia, along the bed of the former Washington & Old Dominion Railroad. The pace of change in Leesburg and Loudoun County accelerated after the end of the Second World War. With the end of war-time restrictions on fuel and rubber, and new with government programs like the GI bill, which enabled returning veterans to pursue higher education opportunities previously out of reach, a life dominated by the cycles of agriculture was challenged. Leesburg experienced growing pains as the population grew and Leesburg became increasingly integrated into the greater Washington area. Nonetheless, many residents advocated measures to retain Leesburg’s historic character. The civil rights era further changed the town, although racial integration in Leesburg was not marked by the violence seen in some southern towns: high schools began desegregating in 1962 and were fully integrated by 1968.